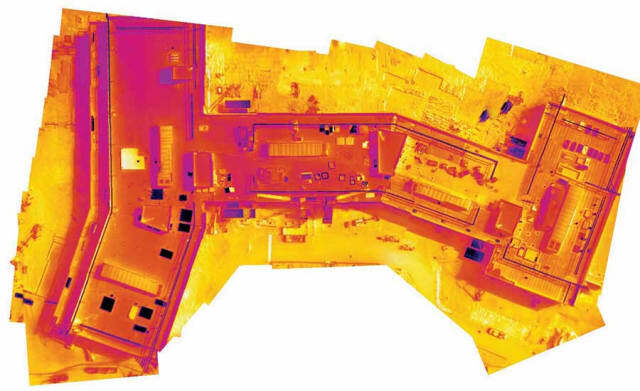 Drone software company DroneDeploy recently announced the launch of its Thermal Live Map, a thermal mapping tool that allows drone operators to see temperature variability on the ground in realtime. The tool joins the company’s recently released Live Map, which performs the same kind of real-time data transfer for visible-spectrum light. With Thermal Live Map, drone operators can get live thermal footage from their drones streamed directly to their smartphones, without needing an SD card or an Internet connection. The display is colorcoded to show temperatures, and operators can view both the data as it’s collected and the larger image it’s being “stitched” into. The map. which is saved to the phone or tablet, syncs to the cloud once the device is connected to the Internet. Real-time thermal imaging can help solar panel operators like McCarthy easily locate overheating panels, but it also has many other possible applications: finding cracks and temperature leaks in buildings, locating people lost in dense terrain like forests, and even helping firefighters locate where a fire is hottest.